It seems as if we spend so much time filling our days with activities that finding down time, time to be alone is fleeting. Some people feel guilty when they are alone, some don’t like being alone and some think being alone is the same as being lonely. But being alone is necessary to our personal growth and development. Being alone and being lonely are two different things. Being alone is something we do to fuel our soul and energize our life, while be lonely is living a life that disconnects us from others. One fosters personal growth, and the other keeps us stuck. Any activity you can do with others, you can do alone. We are just so used to inviting friends and families on our outings, that we rarely give ourselves the opportunity to do things by ourselves. Be spontaneous and the next time there is a desire to go to the movies, out to dinner, or even do some shopping, opt to do it alone. It might seem odd at first, and that’s okay. If we allow ourselves just to observe and process what is happening around us without judgment, we will gain an important perspective and some valuable information to help us understand our needs and wants better. There is a movement going on in the world, one that is highlighting the importance of slowing down and enjoying the moment. There is no better way to slow down and become more mindful of the world around you than to spend some time alone. Not convinced? Well, there are plenty of reasons why spending time alone is good for us, the first being that it forces us to slow down and become more observant. Here are a few more. 1. Being alone clears the mind. There is a lot of chatter in our lives. The media, our colleagues, our friends and our family all contribute to how we form our opinions through expressing theirs. When we take the time to be alone, we can clear our mind of all the noise and allow our inner voice to become clear. 2. Being alone fosters creativity. Creativity happens when our mind is free to explore and wander. When we are alone, there aren’t competing thoughts and agendas, which allows our mind the freedom to take a journey based on true inspiration. 3. Being alone builds confidence. Confidence is hard to build with so many outside influences. 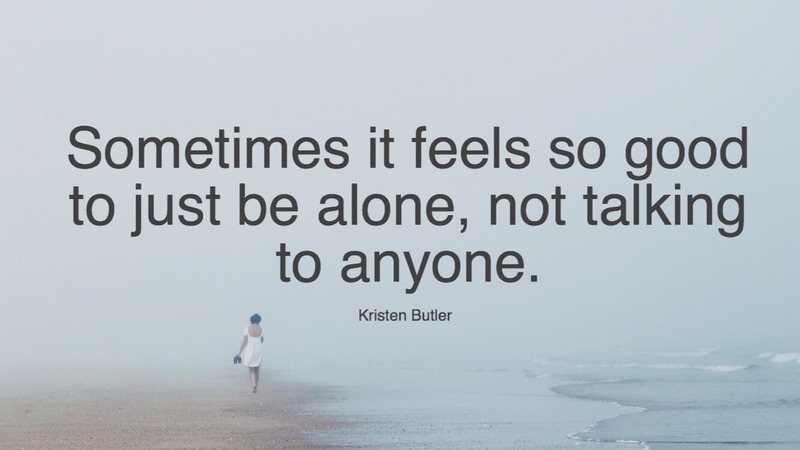 Being alone allows us to develop our authentic voice based on our values. This voice becomes stronger and steadfast when we are firmly planted in what matters most to us, not those around us. 4. Being alone encourages independence. Being comfortable thinking and acting independently of our support network is the key to living our best life. When we spend time alone, we are allowed to dream and create goals that allow us to evolve independently of others. 5. Being alone clarifies perceptions. The perceptions we have come to life based on our experiences and emotions at the moment. When we take the time to remove ourselves from the experience and spend time alone processing the events free from the emotion and influence, we gain clarity around the judgments we initially made. 6. Being alone diminishes stress and anxiety. Stress and anxiety occur because of outside expectations. The importance of those expectations become less urgent if we can put some perspective on them, and that happens when we spend time alone. 7. Being alone establishes priorities. It’s important that we continually assess what’s important to us. The best way to get to know ourselves and what matters most is to spend time alone. Without the competing priorities of everyone around us, we can get real with ourselves and true passions. 8. Being alone boosts productivity. When we’re alone and able to get clear on our dreams, goals and priorities, an excitement bubbles. That excitement is the motivation that propels us into specific actions to support those goals and priorities. It makes us eager to work and gives us the energy to do the things that support our big plan. 9. Being alone strengthens relationships. Believe it or not, spending time alone supports and strengthens the relationships with the people that matter most to us. When we have the time to understand and value ourselves, we are better able to understand and value others.